I am so pleased to offer 4 of what I consider ground-breaking silhouettes from one of Edouart’s “finished” folios. 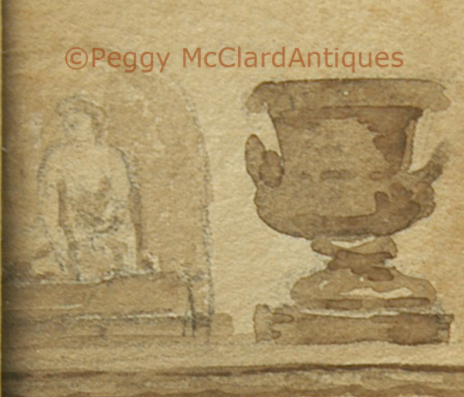 In 1923 a folio was sold by E.F. Bonaventure Inc, of New York to Miss Sarah C. Hewitt and referred to as “1 Vol. Silhouettes of eminent Americans by Edouart.” Bonaventure supposedly acquired the folio in Paris, but no clear records support that. The American folio includes single-sided pages of lithograph or watercolor backgrounds on which Edouart pasted figures of important Americans. 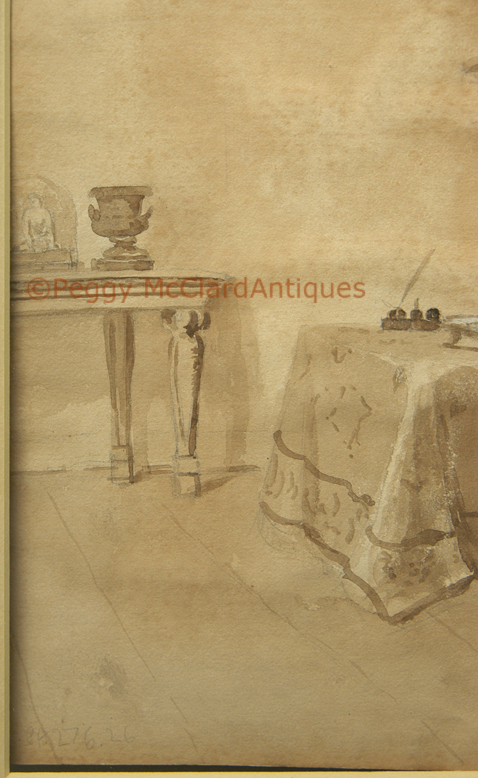 Within that folio, Edouart had most of his sitters autograph the background on which the figure was pasted. He also usually included the date and place of titles along with descriptive titles of the sitters. The American folio is in the collection of the National Portrait Gallery in Washington DC. 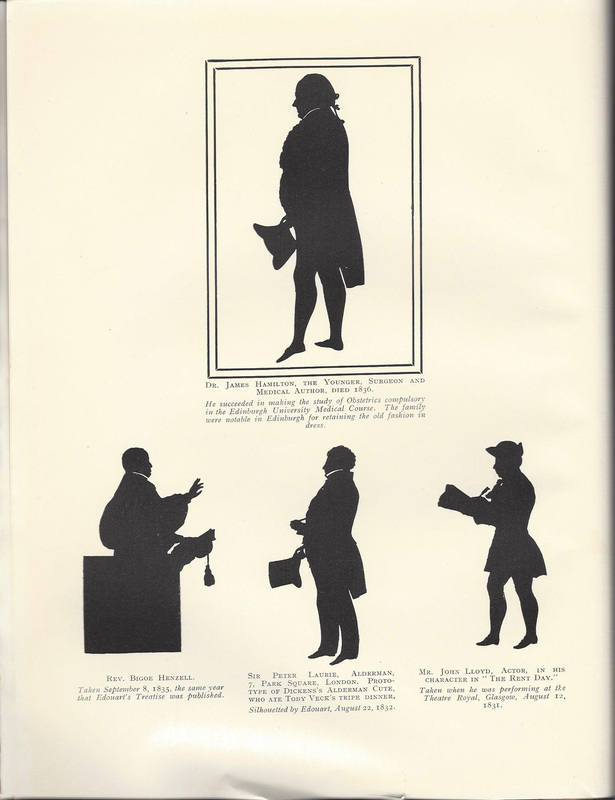 and is the focus on Auguste Edouart’s Silhouettes of Eminent Americans 1839 1844, Andrew Oliver, Published for the National Portrait Gallery, Smithsonian Institution by the University Press of Virginia, Charlottesville, 1977. Recently, another finished folio came up for auction. It contained important Irish figures--all subjects in the folio were men. The backgrounds were mostly lithographs with a few watercolor backgrounds. An 1838 advertisement by Edouart refers to “His Belfast Book of Public Characters”. Among other things, the ad reads, "His Belfast Book of Public Characters is likewise very interesting, by the correct delineations of the features, attitudes, and natural expression of our most distinguished personables who have honoured him with a sitting." Belfast News-Letter, Friday 23 November 1838. It seems clear that Edouart kept fully finished folios of distinguished citizens of places that he visited for marketing reasons. What better way to market your abilities as an artist than to present stunning folios gathering the most important people who have sat for you and presenting them on fully furnished backgrounds? These folios must have been very impressive to the people who flocked to Edouart’s arranged galleries throughout the British Isles and America. Now, these four double-sided silhouettes with watercolor backgrounds indicate another “finished” folio by Edouart. 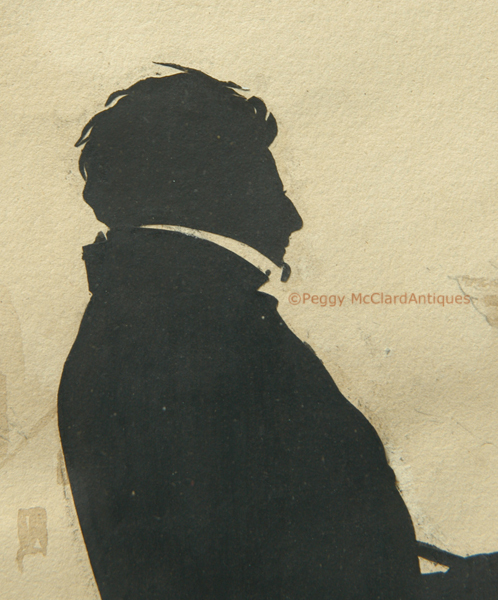 Unfortunately, at this time, the only provenance we have for these silhouettes prior to 2014 is that the came from a private collection and had previously been purchased from David Ker Fine Art in London, probably during the 1980s. They came to me very recently from England and do not appear to have ever been framed. With the exception of the page with Sarah Hamilton, each page has Edouart’s page number written into one corner. (Apparently, Hamilton’s page number was previously cut off although the reverse of that page still contains its page number.) The pages are not all evenly cut and some of the writing is so close to the paper’s edge that it appears that the pages have been cut just a little. Considering the paper size of the recently offered Irish folio at Sotheby’s, each page is an appropriate size, which indicates that only slight edges have been cut. They came unframed and I had them framed in period bird’s-eye maple frames of similar (but not exact) profiles and similar (but not exact) profile period gilt liners. Early glass has been placed on the front and back of each silhouette. The pages are held in place between two pieces of acid-free ragboard, very lightly held with tiny dots of acid-free rice starch. Every effort was made to allow all writing and page numbers to remain visible. Unfortunately, in most cases, the page numbers had to necessarily be covered to avoid covering some of the more important inscriptions at the bottom of the pages. As will be noted in the individual listings, the very bottom edges of some of the pages is loose between the envelope of ragboard. 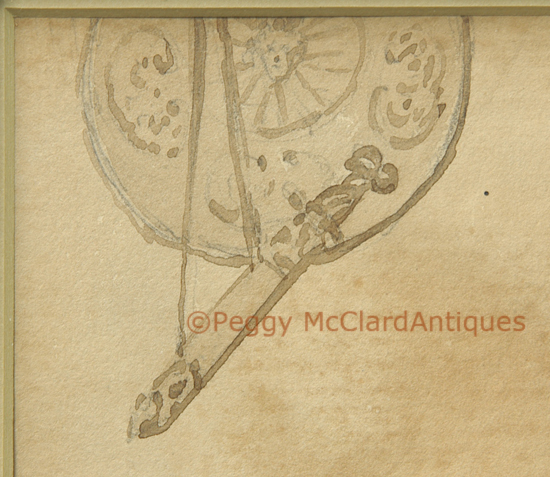 This was necessary to allow the inscriptions to show but does allow the very bottom of the paper to swing freely when the silhouette is not stored in an upright position. I tell you this because there is a slight possibility that, during shipping, the very tiny amount of the top of the silhouette paper may pull loose from the top hinge of the ragboard frame and will require a trip to a good framer to open the frame and replace the paper between the ragboard with good conservation materials (i.e. rice starch). Some of the pages have very lightly penciled collection numbers in corners. Framed sizes are ever so slightly different because variables surrounding the effort made to show as much of each sheet of paper as possible and slight variations in sizes of the sheets of paper (which are each approximately 13 ½” x 10”). 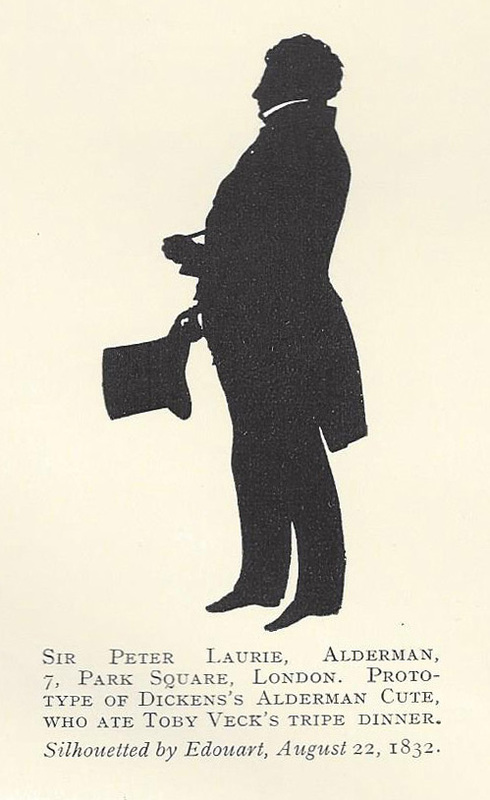 This is a fabulous silhouette of Sir Peter Laurie (1776-1861). His father John Laurie was a small landowner and farmer. Laurie originally planned to join the ministry in the Church of Scotland, but entered apprenticeships in saddlery instead. After 3 years of apprenticeship, he moved to London where he became employed by the saddler to King George III and soon became foreman of the shop. In 1801, he opened his own successful saddlery from which he retired in the 1820s. Through his admission to the Saddler’s Company, Laurie met London’s leaders and became a politician, himself, 1826 when he was elected Sheriff of London. He championed better treatment for prisoners and more humane hangings. Laurie served as a magistrate for Westminster, and in 1826 he was elected alderman for Aldersgate. 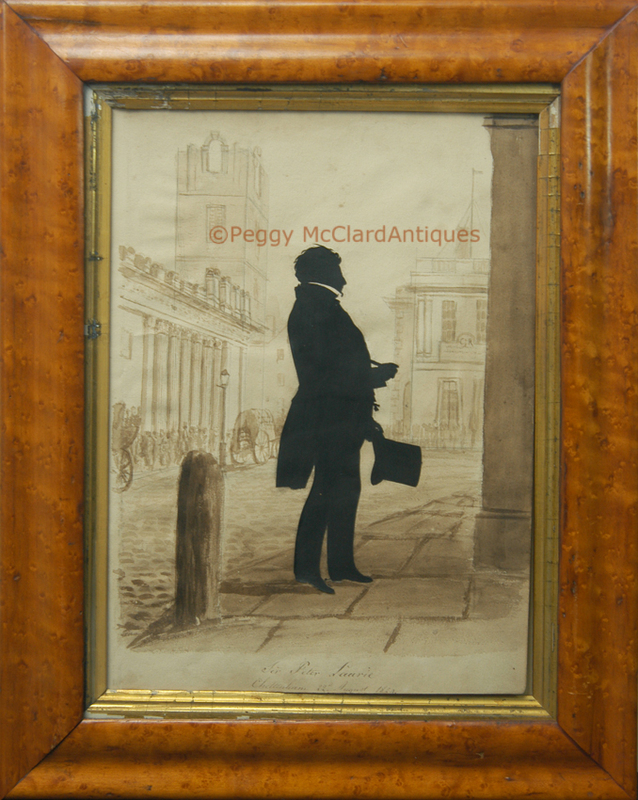 In 1832 he held the office of Lord Mayor of London. 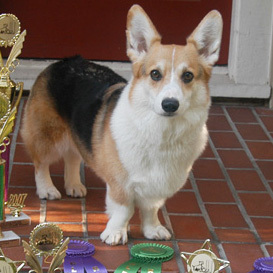 The following year he became master of the Saddlers’ Company. In politics, Laurie promoted social advancement and more open government. He opened the Middlesex bench hearings and Court of Alderman proceedings to the public. His many proposals were published as pamphlets, along with two books advocating prison reform. He was also President of the Brideswell and Bethlehem Hospitals. Peter Laurie was knighted in 1824. In 1839 Peter Laurie became the first chairman of the newly established Union Bank of London. He was appointed governor of the bank in April 1839, a position which he held until his death over twenty years later. Laurie married Margaret Jack, daughter of John Jack, at St Martin-in-the-Fields, London in 1803. They had no children but adopted two of Laurie’s nephews. Laurie died at home in 1861 and is buried at Highgate cemetery. 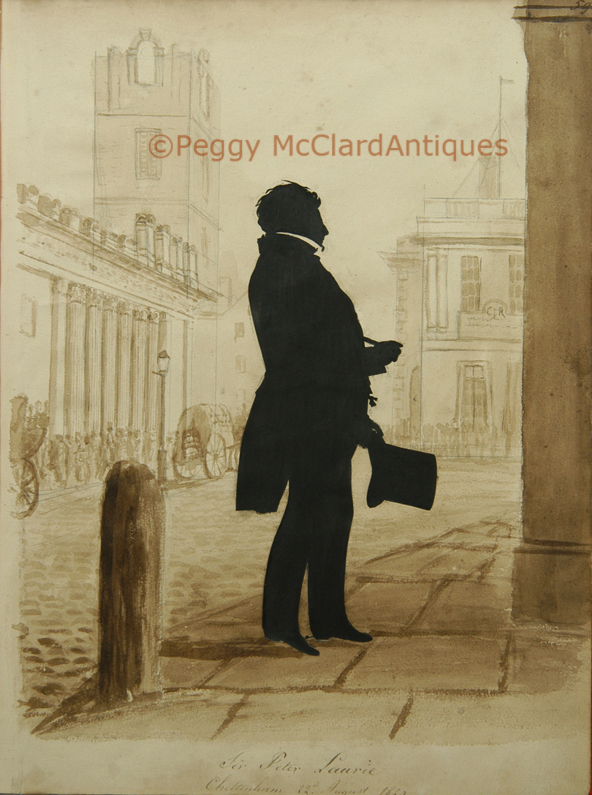 In this wonderfully detailed silhouette, Sir Peter Laurie holds his pocket watch in one hand and top hat in the other. Note the spurs on his boots (the right accessory for a saddler). 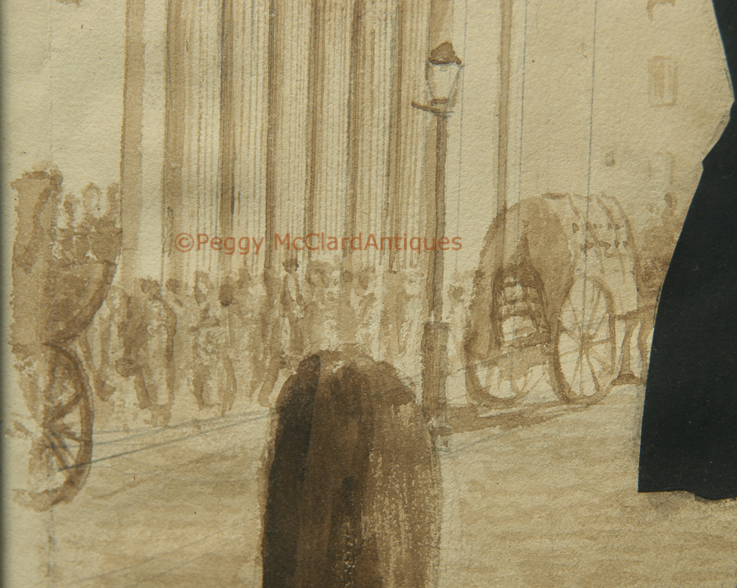 Behind him is a wonderfully detailed busy street scene with a colonnaded building, incomplete tower and lots of pedestrians and carriages. 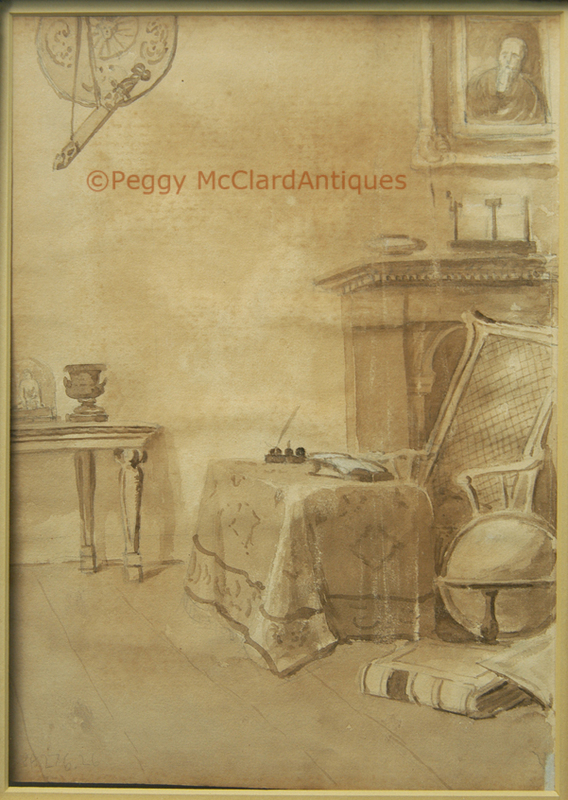 Inscribed with sitter's name and dated “Cheltenham 22nd August 1829.” The duplicate (mirror image) of Laurie illustrates Mrs. Jackson’s book at page 11. The Laurie duplicated is also noted in Mrs. Jackson’s list at page 146 in the same book. The page with Laurie’s silhouette bears Edouart’s handwritten page number “59” in the upper right corner. 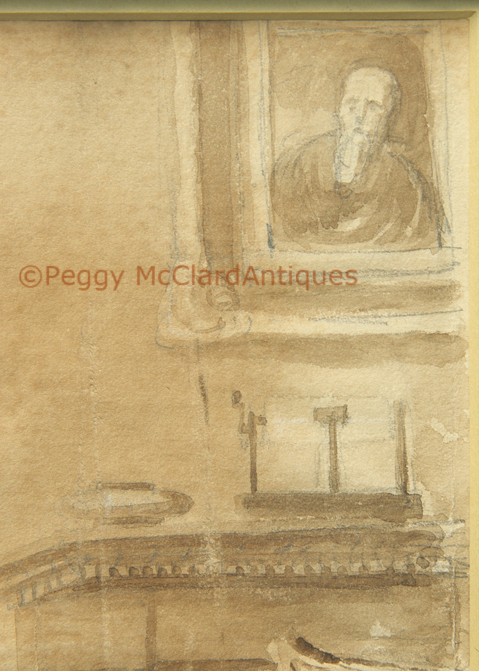 The reverse side is another interior scene with a cane-backed arm chair, fabric covered desk with desk set and open book, portrait above the fireplace, table with urn and globe covered classical figure (perhaps a clock? 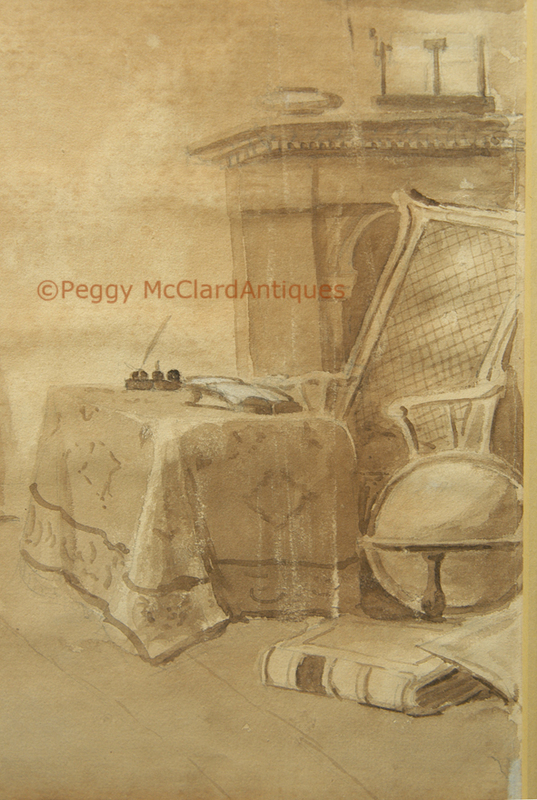 ), a globe and curious objects on the mantle and hanging on the wall (lighting devices?). The reverse page bears Edouart’s handwritten page number “60” in the upper left corner. There is no impression on the reverse painting to indicate that Edouart ever pasted a silhouette on it, nor is there an inscription on this side of the page. 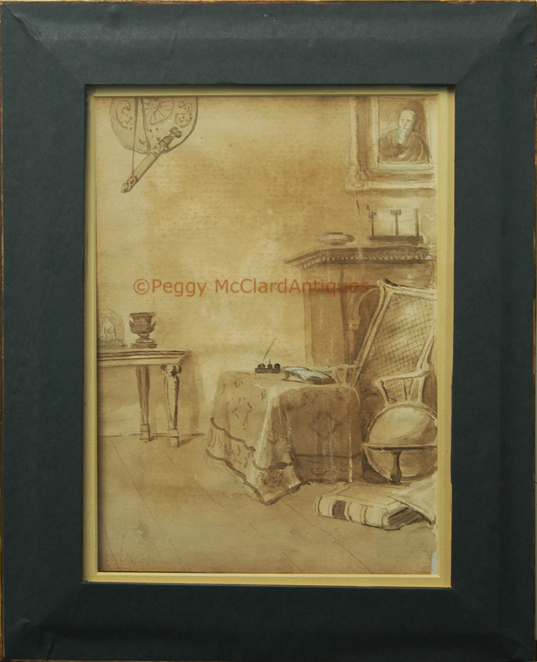 Framed size 18 ½” x 15”. 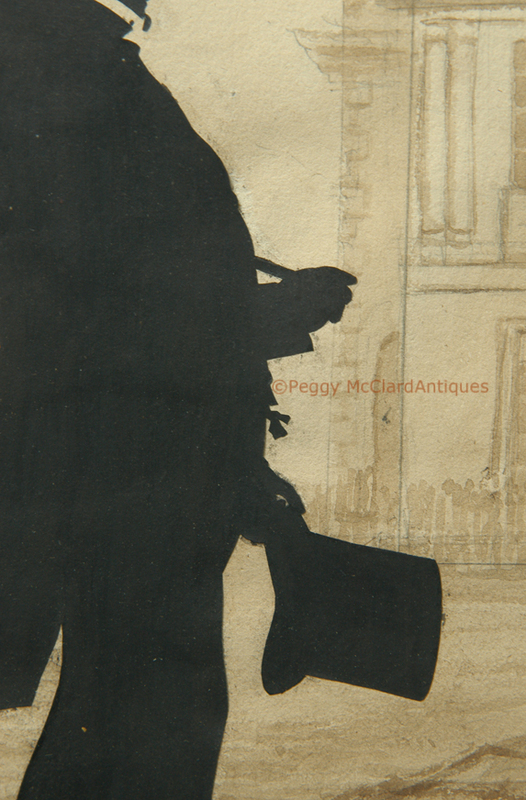 Jackson, Mrs. F. Nevil, Ancestors in Silhouette by August Edouart, The Bodley Head, London; John Lane Co., New York. 1921, 11 & 146, illustrated plate opposite 11. “Peter Laurie”, RBS Heritage Hub, online at http://heritagearchives.rbs.com/people/list/peter-laurie.html, gathered December 14, 2014. Please see the Silhouettist Bios page for more information about Augustin Edouart.